Conservatives were correct: we have record-breaking inflation! What’s next? Summary: Today we look at inflation, past and present. It tells much about who to trust for economic analysis, the current state of the US economy, and what we can expect in the future. Why has inflation fallen since 2011? During 2010 and 2011 the media overflowed with confident and dire warnings from conservatives of inflation — or even hyperinflation — coming quite soon. They were totally wrong, as economists such as Paul Krugman said at the time. Instead inflation has slowed, by some measures hitting record low rates. As the posts at the end show, readers of the FM website saw the correct side of this debate (this has been added as a win on the Past Predictions page). Today we look at what actually happened, and what this might mean for our future. real interest rates (red, here measured by the difference between the two). 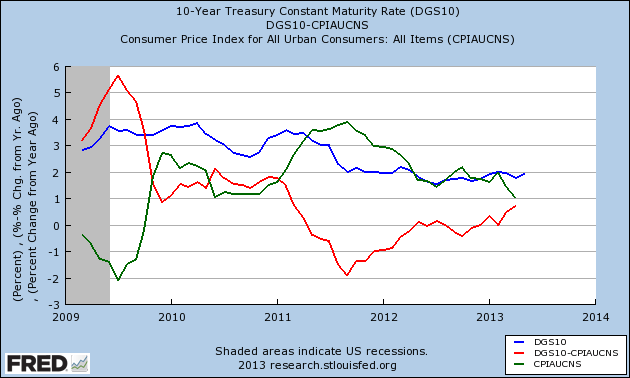 Blue: Treasury rates; Green: CPI; Red: real rates. We see the effects of the Fed’s increasingly aggressive monetary policies, intended to boost CPI inflation and lower real interest rates. They have not done these because the recovery is wonderful, but because it is too slow. Note that one of these is unlike the other two. QE1 from November 2008 to June 2010 — it broke deflation, boosting the CPI and forcing down real rates. QE2 from November 2010 – June 2011 — another boost to CPI, further depressed real rates. QE3 from October 2012 — still running, but with inflation falling and real rates rising. A strong recovery pushes up nominal rates, as demand for funds increases and the Fed pulls back monetary stimulus. Eventually capacity utilization increases (including for labor), and inflation pops up. That’s not the US today. Nominal rates were flat until recently; real rates rose only due to falling inflation. Recently nominal rates have risen on excitement over forecasts of GDP growth accelerating through 2016 (doubling to 4.5%, a rate not seen since 2000). It’s not what we have today. 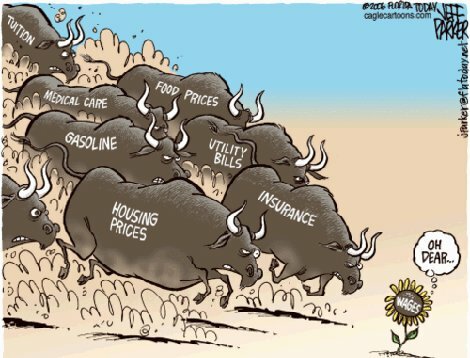 Falling inflation has become a problem. The Fed has set a “floor” for inflation at 2%. Deflation is horrific for a high-debt economy like ours, and the floor allows the Fed time to take preventive action — as Bernanke described in his famous “we have a printing press” speech in 2002, and has he did after the crash in 2008. Rising real interest rates act to slow the economy, not what we need now as GDP growth has limped along since 2009 at the 2% “stall speed rate”. The government has applied fiscal and monetary stimulus when it slows much below that (where recession risks increase). Slow growth, inflation falling towards zero, and rising real interest rates — an ugly combination for the Fed to deal with, especially with the monetary throttle already pushed beyond the gates into “unconventional-seldom-successfully-tried zone (see this article to put current policy in a larger context). Until this picture changes, I doubt the Fed will pull back (“taper”) its monetary stimulus. Let’s hope that one (or better yet, two) of these factors improves. Rapid growth would do the trick. (4) Why has inflation been slowing since Fall 2011? Lots of theories. I have seen no good explanations. Falling commodity prices. Slower growth in health care prices. Stagnant wages in real terms. Slow growth creating excess capacity utilization. Slowing global growth creating more price competition. Strong US dollar vs Japan and Europe. We should wait for research before guessing about the answer. But I’ll guess anyway. The 19th century long peace of 1815-1914 was a deflationary era (tendency to deflation, with frequent depressions). The next era, after a long painful transition, was the inflationary post-WW2 era. Now we have entered a new transitional period, perhaps with social and technological factors again creating a structural deflationary tendency. And while the rise in real rates is likely a sign of good things to come, right now, it’s causing jitters over the prospect of the removal of monetary stimulus from the market by the Federal Reserve. In the past few weeks, those jitters have caused a bout of weakness in stock markets from the U.S. to Europe, from Japan to emerging markets, and almost everywhere in between. All of this begs the question: are central bankers finally losing control of long-term interest rates, which for years following the global financial crisis of 2008 have been their most powerful policy instruments? AN INEVITABLE consequence of the falling inflation and rising bond yields referred to in a recent post is that real yields have risen, as the chart (from Patrick Legland at Société Générale) shows. Real yields in the euro area are now on a par with those in Japan. In this respect, financial repression is disappearing; the US and euro area are no longer inflating away their debt. One aim of Abenomics is surely to drive down real yields by allowing inflation to rise to 2% without a concomitant rise in nominal bond yields, which would make the financing of government debt look perilous. Is the US Government deliberately underestimating inflation?, 8 November 2007 — No. Previous Post Someone call Nixon’s plumbers. We need them again. Try dates from 2000 onwards, and “percent change from a year ago”. The resulting perspective is somewhat different — notably regarding the effect of QE1&2 which seem to have had a continuous, rather than staged, effect on the whole economy — but the tail end of the curve confirms your suspicion that QE3 is fizzling and the USA face a fundamental problem. Notice also the spike in 2006 — at the top of the real estate boom. Thank you for bringing this up! The GDP deflator is another measure of inflation, providing a different perspective — one more useful for some applications. No measure provides THE answer. The GDP deflator does not include price changes of imported items. Especially oil. And it does not show the effect of changes in imports — such as from more domestically produced oil. The PCE and CPI directly measure changes in inflation as they affect consumers, which is what we usually want to measure. Economists can more accurately model consumption patterns to build the PCE and CPI indexes than they can construct GDP. GDP is a horrifically complex (albeit useful) concept, and modeling it is problematic in many ways — hence the solutions are controversial. Using it as the basis for a price index introduces another layer of complexity. For this particular application — constructing real rates — I have never seen the GDP deflator used, perhaps for these reasons. You appear to be some weird sort of troll, wasting our time with these irrelevant references. Nothing you have shown before supports your point, or is even relevant to it. I will not plow through MMT articles in the hope that these might be more relevant than the others you posted. Further comments are moderated until you provide a citation for your assertion, or admit that you can cite no support. Asin raises an important point! Depending on the metric and data source used, world growth has been slowing for a long time. I like the CPB Neatherlands data on world trade and industrial production. Growth in both peaked in Q2 of 2010, and the YoY numbers have slid steadily since then. The world is still growing. But the developed world remains somewhat stagnant, and the emerging nations are slowing rapidly. Some of the emerging nations look at risk for a serious decline, such as China and Brazil — whose recessions would take some of their trading partners down with them (e.g., China => Australia). Why has inflation been slowing since Fall 2011? Lots of theories. I have seen no good explanations. Inflation has been slowing due to increasing saving desire, including deleveraging, post-crisis, resulting in a “balance sheet recession” (Richard Koo). The recession will continue until deleveraging is complete and balance sheets rebuilt, so that consumers and firms are ready for another round of borrowing and lenders experience increasing demand from creditworthy customers willing to pay the going rate. Meanwhile, govts are not offsetting the increased private saving desire not offset by increased exports. Most countries are trying to export their way out — impossible for all in a closed global economy and difficult for many in slowing one — instead of using fiscal policy to equalize the fiscal deficit with consolidated non-govt saving desire, which results in a non-govt surplus. By identity the govt fiscal balance and the non-govt balance must sum to zero. Whether the identity holds at full employmentis a matter of govts adjusting their fiscal balance to accommodate increased non-govt saving, since the non-govt balance is non-discretionary. Govts that are sovereign in their own currencies and that do not accumulate debt not obligated in their currency have the policy space to expand their deficits and debt without an insolvency constraint. The constraint is price stability, and inflation is not an issue when the economy has ample resources to expand to meed increased effective demand. So inflation is not an issue for countries like the US, UK, Japan, etc. but it is an issue in the EZ where nations have forfeited currency sovereignty to the ECB. Thus, the ECB needs to accommodate fiscal deficits of member nations as determined by saving desire offset through bond purchases. Deflation is the threat now and monetary policy has pretty much exhausted its capacity at this point. Fiscal in needed. This is a very simple problem to solve fiscally but the commitment is to monetary policy rather than fiscal policy in many nations, although the US is quite liberal wrt to others and is at least muddling along. Monetary policy doesn’t work because there is no transmission mechanism between reserves and effective demand. QE just results in asset appreciation but not increased spending, since those owning portfolios tend to save portfolio gains rather than increase spending. Can you give us one or more citations supporting this theory? As I recall it, the usual relationship described is a positive relationship between the household savings rate and inflation — not the negative one you describe. This is a staple of the economic literature for at least 40 years (i.e., ancient history, when I was in college). More technically, it is a relationship between changes in income, inflation, and savings. Less technically, look at the graph of changes in the personal savings rate and the CPI during the past few years. I see no obvious pattern. Tom raises an important point, one widely misunderstood. The US as a whole as not deleveraged, measured by debt outstanding (there are other ways to measure this). Not by a dime. See the Fed’s Flow of Funds statement. * Business sector reduced its debt in 2009, but since then borrowings have taken total debt to new highs. * Households have deleveleraged every quarter (except for 2) after Q1 of 2008. * State & local governments reduced their debt in 2011 and 2012. But borrowing by the Federal government more than offset that, so that total domestic non-financial debt increased every quarter (as it has for a long long time). As in Japan, government borrowing provided economic stability while other sectors deleveraged — preventing severe economic contraction. The long-term consequences are as yet unknown, depending on our actions now and in the future. Wynne Godley and Mark Lavoie, Monetary Economics: An Integrated Approach to Credit, Money, Income, Production and Wealth (Palgrave Macmillan; Second Revised Edition, 2012, ISBN-10: 0230301843) stock flow consistent macro modeling using sectoral balances. Jan Hatzius, chief economist for Goldman uses Godley modeling and is highly reputed for his forecasting. For a short summary of basics on sectoral balances and saving desire, see Stephanie Kelton, What Happens When the Government Tightens its Belt? and What Happens When the Government Tightens its Belt? (Part II). I don’t believe those four citations provide support for your statement. (1) I have read Koo’s book, and all of his reports at Nomura for many years. I don’t recall him saying anything like that. I have quickly searched his reports for the past six months and see nothing like that. A cite is more than pointing to a book; we need a quote or a page number. (2) I have not read the late Wynne Godley’s book, but did read his great reports at Levy Institute for many years. I don’t recall him saying anything like that. Again, please provide a citation or quote. (3) Pointing to the two articles is great, as we can search them for a mention of “inflation”. Unfortunately my browser shows NONE in either article. I find that disturbing, a challenge to your credibility. If I missed something, please point to it. IN the US as in most developed countries, money enters the economy in only two ways, either by private borrowing from banks where loans create deposits and the net is zero endogenously, or through government deficits, in which case consolidated non-government net financial assets increase, since the liability is exogenous to non-govt. The borrowing of the federal govt as currency issuer is equal to the net financial wealth of non-govt in aggregate, i.e., net savings in the currency, which is shared by private parties, financial institutions with access to the central bank, and the external sector. This excludes govt debt held within govt, e.g., as assets of the central bank. When the central bank buys govt debt, then it credits reserve accounts. This changes the composition and term of govt obligations but not the amount of consolidated non-govt net financial assets in aggregate. Please, a citation. It should take on a minute to find. The Internet is awash with people making up stuff about … everything. This cuts thru to see who knows the subject, and how doesnt. More complete treatment in L. Randall Wray, Modern Money Theory: A Primer on Macroeconomics for Sovereign Monetary Systems (Palgrave Macmillan, 2012), ch. 3 & 4. Abstract: This paper deploys a simple stock-flow consistent (SFC) model in order to examine various contentions regarding fiscal and monetary policy. It follows from the model that if the fiscal stance is not set in the appropriate fashion that is, at a well-defined level and growth rate – then full employment and low inflation will not be achieved in a sustainable way. We also show that fiscal policy on its own could achieve both full employment and a target rate of inflation. Finally, we arrive at two unconventional conclusions: first, that an economy (described within an SFC framework) with a real rate of interest net of taxes that exceeds the real growth rate will not generate explosive interest flows, even when the government is not targeting primary surpluses; and, second, that it cannot be assumed that a debtor country requires a trade surplus if interest payments on debt are not to explode. The first paper does NOT EVEN MENTION INFLATION, let alone show that deleveraging causes inflation. The second discusses inflation, but does not support your point. Most people learn this in their freshman year. FM: Why has inflation been slowing since Fall 2011? Lots of theories. I have seen no good explanations. TH: Inflation has been slowing due to increasing saving desire, including deleveraging, post-crisis, resulting in a “balance sheet recession” (Richard Koo). The recession will continue until deleveraging is complete and balance sheets rebuilt, so that consumers and firms are ready for another round of borrowing and lenders experience increasing demand from creditworthy customers willing to pay the going rate. I based this claim on Godley’s sectoral balance approach and Abba Lerner’s functional finance as combined in MMT. However, this point is not controversial among Keynesians. Here is Paul Krugman stating it, although his analysis is flawed in that his understanding of how the present monetary regime works. He is mixing up flxed rate and floating rate in presuming loanable funds. PK: In fact, however, the deleveraging• shock has been so large that we’re hard up against the zero lower bound; interest rates can’t go low enough. And so we have a persistent excess of desired saving over desired investment, which is to say persistently inadequate demand, which is to say a depression. What to do? One answer is fiscal policy: let governments temporarily run big enough deficits to maintain more or less full employment, while the private sector repairs its balance sheets. The other answer is unconventional monetary policy to get around the problem of the zero lower bound: maybe unconventional asset purchases, but the obvious answer is to try to create expected inflation, so as to reduce real rates. • Deleveraging is a form of saving, i.e., the domestic private sector chose to run a surplus (“save) while the external sector was also saving in USD (a CAD is offset by a KAS), so the federal government needed to dissave, i.e., run a large enough deficit to offset the non-govt surplus. The federal govt fell short, so effective demand did not recover, resulting in disinflation and threatening deflation, which the Fed has been fighting with monetary policy by low rates and bond buying to create asset inflation and increase the wealth effect in the hope of stimulating more spending (effective demand). The difference between PK and Post Keynesians, including MMT, is that PK is basically a monetarist other than at the zero bound, and Post Keynesians are fiscalists. Keynesian moneratists like Krugman think that monetary policy can operate on effective demand to control price stability except that the lower bound, Post Keynesians like the MMT economists think that fiscal policy is the wiser course generally since it operates directly on effective demand rather than obliquely through interest rates, which tend to affect asset prices more than effective demand, thereby resulting in distortions. Post Keynesians, especially that follow Minsky (Wray was Minsky’s student), are also opposed to the NAIRU and Taylor rules to balance price stability and employment, since it results in permanently idle resources. They propose a fiscal solution that eliminates that drag. The links I provided give the Post Keynesian-MMT rationale behind this based on a description of the currency monetary regime, Godley’s sectoral balance approach (as used by Jan Hatzius at GS), and Abba Lerner’s functional finance as the basis of fiscalism. MMT also uses a version of MInsky’s job guarantee with the fed govt as employer of last resort to mop up residual unemployment, while establishing a price anchor (one hour of unskilled labor + benefits as the JG wage) against inflation. Admittedly some of this is controversial, but if you are into OODA, then OO requires looking at all relevant info. MMT begins with observation and description of the current monetary regime and orients through the macro analysis, which differs significantly from the mainstream approach based on neoclassical economics and monetarism. The mainstream approach is taking the US over the cliff through failure to observe and orient properly before deciding and acting through policy formulation and its implementation. I’ve provided references that lead into a more complete understanding of this alternative POV, which I believe to be reality-based rather than fantasy-based, the mainstream models being general descriptions of imaginary worlds. Fine, thank you for showing that you have no idea what you are talking about. That is allI wanted to know. I’m ending this. Here’s why. I said that this looked incorrect, explained why, and asked for a supporting citation. You gave many; the ones I checked not only did not support your statement — but most did not even mention inflation. That’s annoying. You did provide word salad explanations. That’s not authoritative (i.e. you are not like Ed Dolan, an authority on economics), and on the FM website considered useful only if you can cite supporting from some form of expert. We’re here to inform people, not have laypeople debate things for fun (there are a thousand websites for that on every subject). For example, if you had asked for a cite I could have provided many — over a long period. I’m fond of the empirical ones, which cover a long span of time. Here are 2, just to illustrate the process. best of these are subjected to a variety of tests. The present study examines the inter-relationship between economic growth, savings rate and inflation for south-east and south Asia in a simultaneous equation framework using two stage least squares with panel data. The relationship between savings rate and growth has been found to be bi-directional and positive. Inflation has a highly significant negative effect on growth but positive effect on savings rate. Inflation is not affected by growth but is largely determined by its past values and savings rate is not affected by interest rate. These findings for countries in Asia with widely divergent values of aggregates are very relevant for development policies and strategies. You might disagree, and show contrary research. Perhaps from interesting fringes of the economic professions (e.g., MMT or Steve Keen). We’d all learn something from the exchange. “See the Fed’s Flow of Funds statement. * Households have deleveraged every quarter (except for 2) after Q1 of 2008. Not exactly MMT, but often cited by MMT economists. A monetarily sovereign entity accumulating “debt” in a currency it can make at will is not nearly the obstacle to an active economy that private debt is. A monetarily sovereign entity in debt is a useful fiction. It can pay it’s “debt” instantly. It chooses to instead promise to pay MORE money later in order to prevent disbursed money from being spent and triggering inflation. Federal debt, in this way, does not “offset” private debt. If not apples and oranges, they are surely oranges and grapefruit. Federal debt increases the money supply with dollars that have diminished money velocity. Money that starts it’s “life” shackled to an interest bearing Federal Reserve account. The political will to pay off debt so that government spending can resume without the wringing of hands is absent. The current economy suits many parties well. Those with large cash reserves find a crushed global economy very suitable for their position. MMT articles explaining monetary sovereignty would back this up, but would it convince anyone who believes federal debt is like credit card debt? Maybe. It’s quite a disruptive realization and very scarey to many people who thoroughly understand accounting and local economies but haven’t given serious attention to macroeconomics. The rules change drastically much like physics does at the subatomic level. So drastically that stuff that sounds like utter BS turns out to be true. – Subatomic interactions have been modeled that strongly suggest the reversal of time flow. Which of these is harder to believe for the average citizen? Quite so, but it is a fundamental point of mainstream economics as well. Krugman has made it every week for five years, and every few months for 25 years (about Japan’s need for stronger monetary action). This was discussed at length here on the posts about MMT. The economists of the MMT (most? all?) say that governments with their own currency can monetize until they hit one of two constraints: the currency cracks unpleasantly OR inflation spikes up unpleasantly (what is “unpleasantly” depends on the specific circumstances). Lay believers in MMT often get this wrong. Note to all: if you are one of them, please don’t post a comment to disagree about this (it will be deleted). Instead consult one of the economists in that school. They state this often enough. Or find the posts with the tag “modern monetary theory”; or use google. Economists are always welcome to post comments here of any kind or content. we have record-breaking inflation! What�s next? | Fabius Maximus. you list of every one of all your shared sites like your linkedin profile, Facebook page or twitter feed?